Many coating properties such as mechanical, electrical, and ultraviolet (UV) resistance are greatly enhanced by the addition of nanoparticles, which can potentially increase the use of nanocoatings for many outdoor applications. However, because polymers used in all coatings are susceptible to degradation by weathering, nanoparticles in a coating may be brought to the surface and released into the environment during the life cycle of a nanocoating. Therefore, the goal of this study is to investigate the process and mechanism of surface degradation and potential particle release from a commercial nanosilica/polyurethane coating under accelerated UV exposure. Recent research at the National Institute of Standards and Technology (NIST) has shown that the matrix in an epoxy nanocomposite undergoes photodegradation during exposure to UV radiation, resulting in surface accumulation of nanoparticles and subsequent release from the composite. In this study, specimens of a commercial polyurethane (PU) coating, to which a 5 mass% surface-treated silica nanoparticle solution was added, were exposed to well-controlled, accelerated UV environments. The nanocoating surface morphological changes and surface accumulation of nanoparticles as a function of UV exposure were measured, along with chemical change and mass loss using a variety of techniques. Particles from the surface of the coating were collected using a simulated rain process developed at NIST, and the collected runoff specimens were measured using inductively coupled plasma optical emission spectroscopy to determine the amount of silicon released from the nanocoatings. The results demonstrated that the added silica nanoparticle solution decreased the photodegradation rate (i.e., stabilization) of the commercial PU nanocoating. Although the degradation was slower than the previous nanosilica epoxy model system, the degradation of the PU matrix resulted in accumulation of silica nanoparticles on the nanocoating surface and release to the environment by simulated rain. 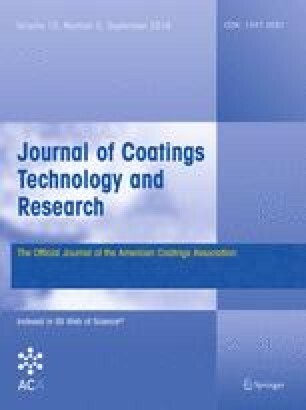 These experimental data are valuable for developing models to predict the long-term release of nanosilica from commercial PU nanocoatings used outdoors and, therefore, are essential for assessing the health and environmental risks during the service life of exterior PU nanocoatings.